Ivan A. Getting, IEEE President, 1978, is credited (along with Roger L. Easton and Bradford Parkinson) with the development of the Global Positioning System (GPS). He worked at the MIT Radiation Laboratory (where his group developed the first automatic microwave tracking fire control radar, the SCR 584) and the Aerospace Corporation. Ivan A. Getting was born in New York City on January 18, 1912. An Edison scholar, he earned his B.S. in Physics from MIT in 1933. He attended Oxford University as a graduate Rhodes scholar and earned his D.Phil. in Astrophysics in 1935. During most of his life Ivan Getting directed his scientific, technical, and administrative energies to the support of the U.S. defense effort. Ivan Getting's scientific career began in 1935 at Harvard University. As Harvard Fellow, his research involved cosmic rays and nuclear physics. In 1940, he went to the MIT Radiation Laboratory as director of the Division on Fire Control and Army Radar, where his group developed the first automatic microwave tracking fire control radar-the SCR 584-which was credited with helping to save London from destruction by V-1 buzz bombs during World War II. He also led the development of the Navy GFCS MK-56 anti-aircraft fire control system. He was head of the Naval Fire Control Section of the Office of Scientific Research and Development and a member of the Combined Chiefs of Staff Committee on Searchlight and Fire Control. He also served as special consultant to Secretary Stimson on the use of radar by the Army. From 1945-50, Dr. Getting was professor of Electrical Engineering at MIT and head of the Radar Panel of the Research and Development Board of the Department of Defense. From 1950-51, he devoted full-time service to the Korean War effort as assistant for Development and Planning for the Air Force. From 1951-60, Dr. Getting served as vice president, Research and Engineering at Raytheon Company and also provided technical assistance to U.S. government agencies. His leadership as a "military scientist" was recognized by his election as president of The Aerospace Corporation when it was established at the request of the Secretary of the Air Force in 1960. Under Dr. Getting's direction (1960-78), the company grew into one of the nation's key scientific and engineering resources for ballistic missile and space engineering. As Aerospace president, Dr. Getting had the opportunity to work with NASA’s Mercury and Gemini missions. However his most important lasting contribution was the development and implementation of the Navstar Global Positioning System. Dr. Getting conceived of the idea that a system of satellites could be used to pinpoint locations on earth with great accuracy. GPS was originally planned to guide military aircraft and missiles. While the project faced criticism, with Dr. Getting’s support of the project Dr. Bradford Parkinson directed a group of engineers who designed the Navstar system in the 1970s. Experimental GPS satellites were launched in 1978. Fully functional satellites were then in place by the 1990s. As early as the first Persian Gulf War, GPS was being used to guide smart bombs to specific targets. More recently, GPS has become important in commercial use. GPS helps even directionally-challenged drivers reach their destinations, guides commercial flights, and allows outdoorsmen to roam without becoming lost. Dr. Getting was the recipient of the U.S. Medal of Merit (1948); the Air Force Exceptional Service Award (1960); the IEEE Aerospace and Electronic Systems Pioneer Award (1975); the Kitty Hawk Award (1975). He was made Hon. D.Sc. at Northeastern University (1956) and the University of Southern California (1986). He was a member of the National Academy of Engineering, the International Academy of Astronautics, an Honorary Fellow of the American Institute of Aeronautics and Astronautics, a Fellow of the IEEE, the American Physical Society, and the American Academy of Arts and Sciences. He served as IEEE president in 1978. Dr. Getting was awarded the 1989 IEEE Founders Medal "For leadership of critical programs and enterprises in radar; advanced electronics, space and navigation as well as service to the engineering profession." In 2002, he was inducted into the San Diego Aerospace Museum's Hall of Fame. Dr. Getting and his wife, Dorothea, who passed away in 1976, had three children: Nancy, who is a counselor; Ivan, a geophysicist; and Peter, a professor of physiology. He later married the former Helen A. Griggs. 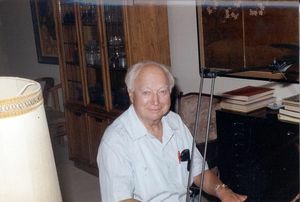 Dr. Getting passed away on 11 October 2003 at his home in Coronado, CA. Ivan Getting IEEE Oral History (1991) This interview is on Getting's work at the Rad Lab. Ivan Getting Oral History (1995). This interview concentrates on Getting's experiences as an IEEE leader and 1978 IEEE President. Anahad O'Connor, "Ivan Getting, 91, a Developer Of Global Positioning System" New York Times, Oct. 21, 2003. This page was last edited on 28 January 2016, at 21:29.